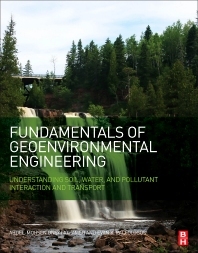 Fundamentals of Geoenvironmental Engineering: Understanding Soil, Water, and Pollutant Interaction and Transport examines soil-water-pollutant interaction, including physico-chemical processes that occur when soil is exposed to various contaminants. Soil characteristics relevant to remedial techniques are explored, providing foundations for the correct process selection. Built upon the authors' extensive experience in research and practice, the book updates and expands the content to include current processes and pollutants. The book discusses propagation of soil pollution and soil characteristics relevant to remedial techniques. Practicing geotechnical and environmental engineers can apply the theory and case studies in the book directly to current projects. The book first discusses the stages of economic development and their connections to the sustainability of the environment. Subsequent chapters cover waste and its management, soil systems, soil-water and soil-pollutant interactions, subsurface transport of pollutants, role of groundwater, nano-, micro- and biologic pollutants, soil characteristics that impact pollution diffusion, and potential remediation processes like mechanical, electric, magnetic, hydraulic and dielectric permittivity of soils. A.M.O. Mohamed is currently employed by Zayed University as associate provost and chief academic officer. He earned his PhD in Civil Engineering from McGill University, Canada. He was then employed by McGill University as the associate director of the Geotechnical Research Centre and as lecturer in the Department of Civil Engineering and Applied Mechanics. He has also held many senior positions in the United Arab Emirates, including United Arab Emirates University (Deputy Assistant Provost for Research, Research Director, Director of Research Support and Services Unit, and Professor of Geotechnical and Geo-Environmental Engineering) and Abu Dhabi University (Dean of College of Research and Graduate Studies). Over the years, he was granted 10 patents, filed/published 8 patents; authored and coauthored 7 books; edited 11 books—published by Elsevier, Taylor & Francis, Balkema, A.A. and J. Ross Publishing. In addition, he has also published more than 250 papers in refereed journals and international refereed conference proceedings. Furthermore, he has been the recipient of several university and nationwide research accolades. He is currently the editor-in-chief of Developments in Arid Regions Research Series Published by Taylor & Francis; editorial board member of Journal of Environmental Geotechnics, Institute of Civil Engineering; executive board member of Arab Healthy Water Association, and of the International Association for Computer Methods and Advances in Geomechanics; editorial board member, International Journal of Recent Patents on Engineering; and the former editorin- chief of the Emirates Journal for Engineering Research. Dr. Evan K. Paleologos is Professor and Chair of Civil Engineering, and Director of the Center in Sustainable Built Environment at Abu Dhabi University, United Arab Emirates. He received his PhD from the department of Hydrology and Water Resources, The University of Arizona, Tucson, Az, USA. His expertise is in the flow of water and the transport of contaminants in porous media. He is the author of two books on environmental risk analysis by McGraw-Hill and the Geological Society of America, and of over ninety journal and refereed proceedings papers. He is the recipient of numerous awards and honors in USA, while at the University of South Carolina, which include the “Researchers of Carolina” and the “Initializer” awards for founding the USC Center for Water Research and Policy. Subsequently in Greece, as faculty at the Technical University of Crete, Science Advisor to the Minister of Environment, and Deputy Chairman of the Athens Water Supply and Sewerage Co. In the UAE he has received the “2014-15 Ambassador,” the “2015-16 Distinguished Faculty,” and the “2016-17 Research” university-wide awards. He is Associate Editor of the Springer journal Stochastic Environmental Research and Risk Assessment. "The narrative of this timely comprehensive text uses simple language and illustrations to expand the scientific knowledge and understanding of geoenvironmental engineering for the reader. New tools are provided to handle the accelerated release of new geoenvironmental data as it becomes available to the scientific community.